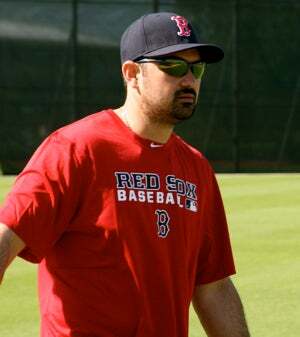 FORT MYERS, Fla. — Adrian Gonzalez carried only his glove onto the field today. After having surgery on his right (non-throwing) shoulder after last season, he’s able to throw, catch and field grounders at first base. But hitting is still a few weeks away. “I would assume I’m ahead of schedule. I just didn’t know if it’s a couple of days or a week,” he said. Gonzalez has been consulting regularly with his surgeon, the well-respected Dr. David Altchek, to get a better sense of when he should start swinging a bat. For now, he’s working on his range of motion and strength. Once formal workouts start next week, he’ll do everything but swing. The tentative plan, Sox officials have said, is for Gonzalez to be swinging a bat around March 1. Gonzo took the field in Fort Myers today. On taking No. 28: Gonzalez spoke to Mike Cameron about getting No. 23, his number with the Padres. But he decided against it. Gonzalez said he has not spoken to any of the Red Sox player outside of Kevin Youkilis, who called to invite him to a charity event. His contact with Terry Francona, he said, has been minimal. He has never spoken to Carl Crawford beyond the standard chatter at first base when the Padres played the Rays. “I’ll be getting to know everybody soon enough,” he said.